Aircraft tracking system, FlightRadar24, was founded in 2007 by a Swedish company, Travel Network, as a system for real time plane tracking. The data obtained by the system is displayed on interactive map and make it possible to monitor the aircraft all over the world. FlightRadar24 cockpit view of the pilot’s cabinA very interesting feature named “Cockpit View” allows you to get in the plane’s cockpit by clicking a “3D” button, located below of the image. You just need to have either Google Earth installed on your PC or Google Earth plug-in for your browser (both accessible through the FlightRadar24 website). The view of the cockpit recreates the view of the pilots along with gauges for airspeed, altitude, direction and shows a two-dimensional view of the aircraft moving across the map. There are even some features that allow you to turn on and off a miniature map showing the current position of the plane, rotate the viewing angle around it and even switch to an exterior view showing a 3D model of the plane over the map. This function is quite similar to flight simulators, however, it is much more exciting to see the pilot’s view from a plane that is actually in flight. Due to the large number of aircraft displayed on FlightRadar24 (around 8,000 planes) there is an unpleasant delay in moving or zooming in and out the map. 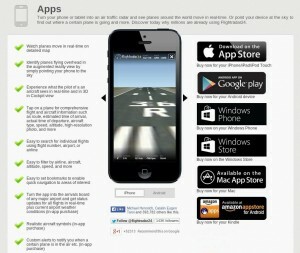 However, there are many filters implemented to facilitate the user activity. The database of this great flight tracking website is updated every few seconds, with the specified real time plane positions on the map. All flight and aircraft data is stored in the system memory of FlightRadar24 for the past 28 days, giving the chance to track not only the current flights, but those already ended. Most of the planes use a general method for acquiring flight information from aircraft, using the defendant Automatic Dependent Surveillance-Broadcast (ADS-B). The ADS-B data allows you to track the movement any cargo or passenger aircraft in any part of the world. Nowadays, no more than 60% of all planes in the world (less than 30% in the U.S., but more than 70% in Europe) are being equipped with ADS-B transponders, but their number is steadily increasing as it is planned the ADS-B to replace the radar as primary source for aircraft data. And like any other rule, this also has number of exceptions. There are some older (A300, A310, A320, B737, B747, B757, B767, MD10, MD11) planes without ADS-B transponder that makes them invisible on the aircraft tracking system, FlightRadar24. But there are also various airline companies or private jets like Cessna, Saab 2000, Saab 340, Twin Otters and MD-80 not equipped with ADS-B transmitters aboard, visible on FlightRadar24, when in areas with ADS-B coverage only. 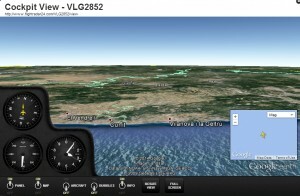 There is also a desktop application of FlightRadar24 for Macs, although the 3D view is only available on the web. Mobile applications of the aircraft tracking system include an augmented reality feature that allows you to point your mobile device’s camera at a plane in the sky and to directly get flight information about it. FlightRadar24 is a really good real time flight tracking & aircraft tracking system with extensive coverage and great features.